Last weekend was one of those rare weekends where we had absolutely no plans, no family gatherings, no birthday dinners, no helping family with errands – we had a totally free weekend!! 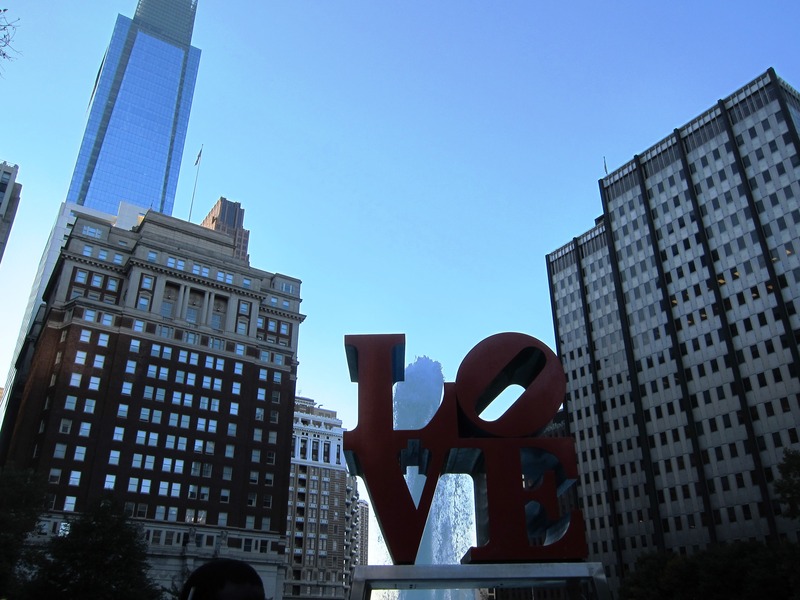 So instead of using that time to relax, we decided to go to Philly for an overnight trip. I’ve been to Philly once as a kid, and another time with some friends about eight years ago. 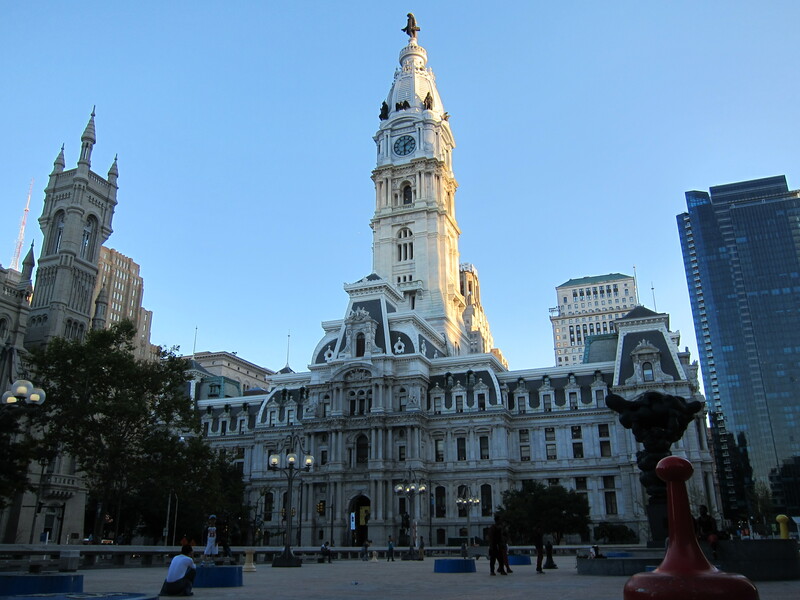 I don’t remember much about Philly from either of those trips, and I was curious to see what that city is like now that I am older. And wiser. Ha. Well, at least the “older” part is true. Aldo has never been there at all. It’s kind of weird, considering that it took us less time to get to the Center City in Philly than it does for us to get into the city sometimes. And for those of you who don’t know, “the city” is New York City. We asked our friend Keri to come along with us. She’s been to Philly several times but it was going to be a beautiful weekend, so why not spend it hanging out in Philly? 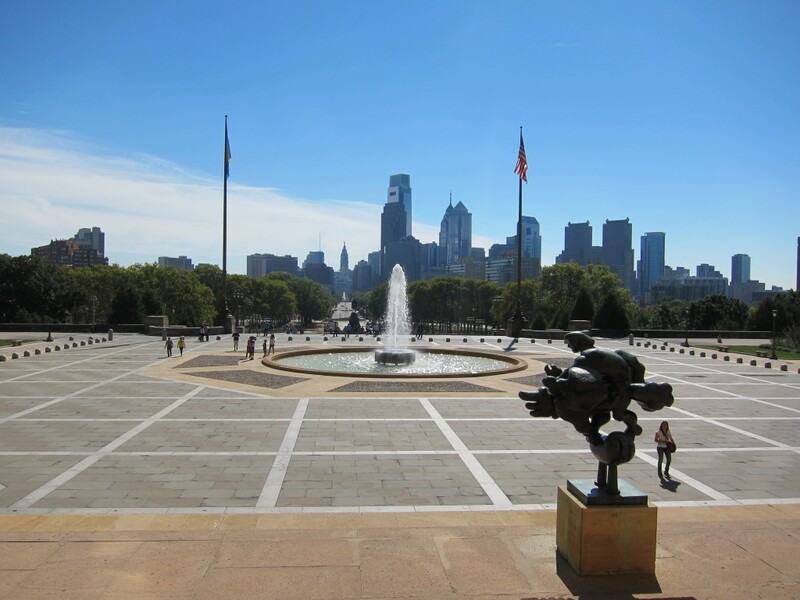 When we got to Philly, we headed straight for the touristy area – the liberty bell, independence hall, etc. We looked at the line for the liberty bell and decided it wasn’t worth it to stand in line for an hour just to see a bell. We are not the kinds of people who like to stand in front of things to take pictures, so this attraction was not for us. Next! Instead, we headed to the Independence Hall Visitor Center and got our free tickets to visit Independence Hall later that day at 4pm. We spent several hours before 4pm exploring everything in the area. 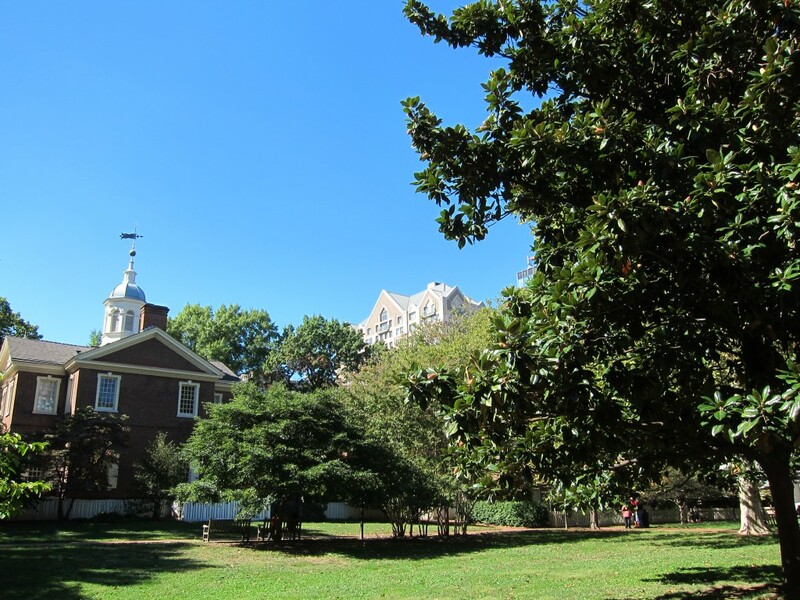 The whole area around Independence Hall was very nice – many tree-lined parks with benches in between all the historical buildings. 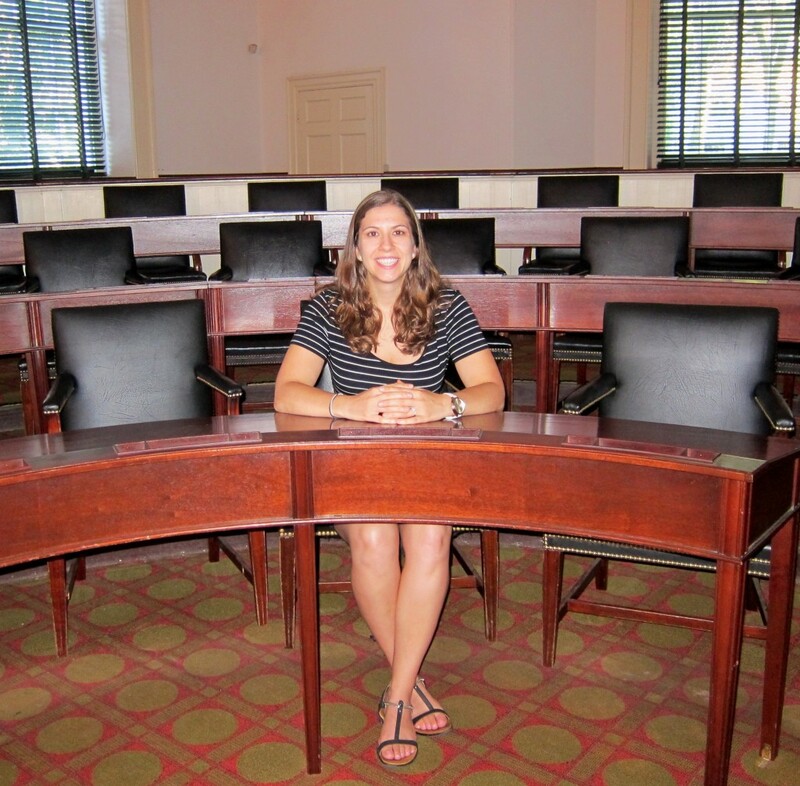 The Ben Franklin Museum happened to be free that day, so we went in. The museum was pretty awesome, obviously, since Ben Franklin was a pretty awesome dude. Even if the museum was not free it would absolutely be worth the $5 to get in. I learned a lot about what Ben Franklin came up with – mile markers, the glass armonica, the first library, and he coined the term “battery” – naming Leyden Jars after the military formation. What a smart man. 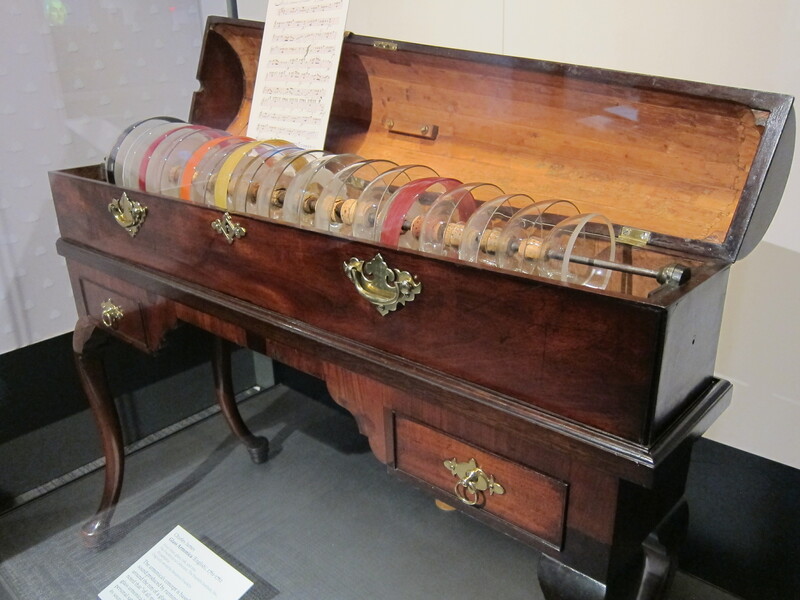 I like to think that if I lived back then I would have also invented quite a few things. 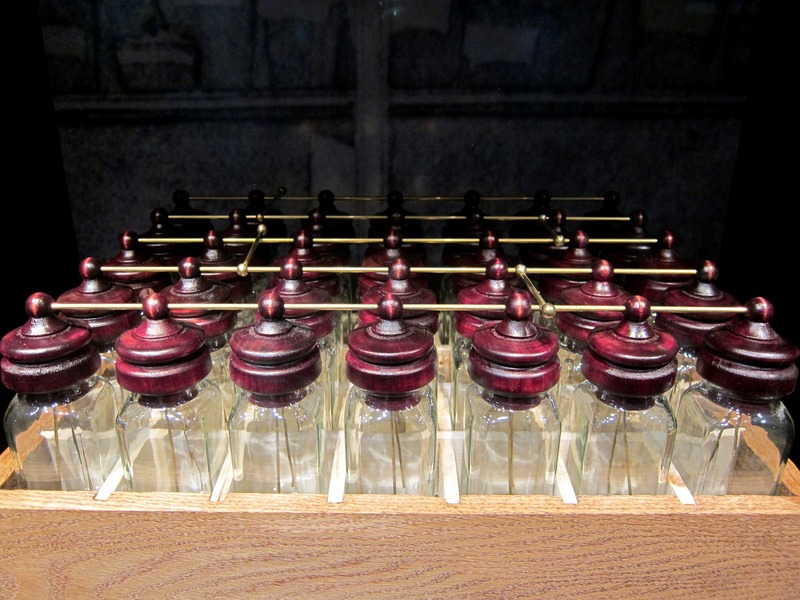 The problem is, everything I think of now has been invented! 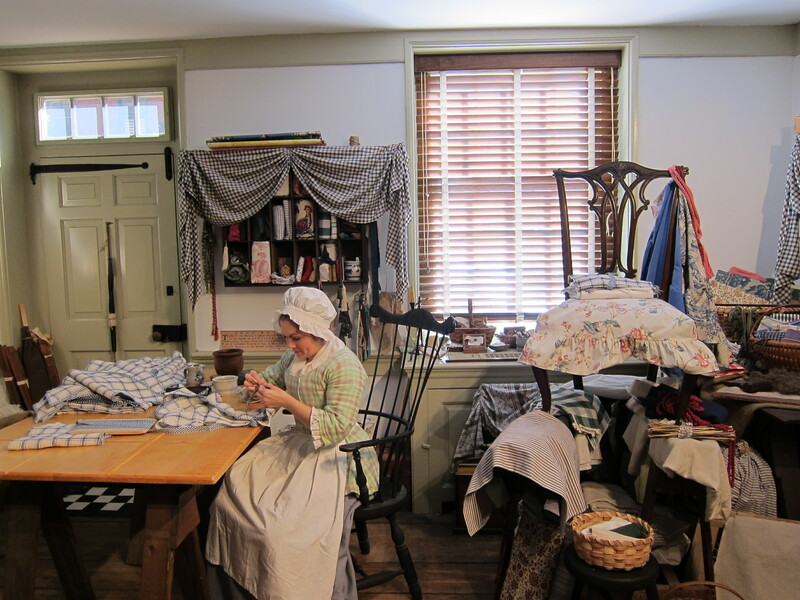 We stopped by Betsy Ross’s House and learned a lot about her life. I love going into old houses and seeing how people used to live. We did that in Boston when we went to the Otis House, so now we had to go check out what a house of a middle class family looked like, as opposed to a mansion. At the Betsy Ross House we learned that our flag almost ended up having 6 pointed stars on it – that is what George Washington asked for. But good old Betsy showed him how much easier it was to make 5 pointed stars. She saved herself a lot of work there! After Betsy’s House we were STARVING. We went to Sonny’s to get a Cheesesteak. I know, I know, you’re supposed to go to Pat’s or Geno’s. But we heard they were overrated, and we were nowhere near them. 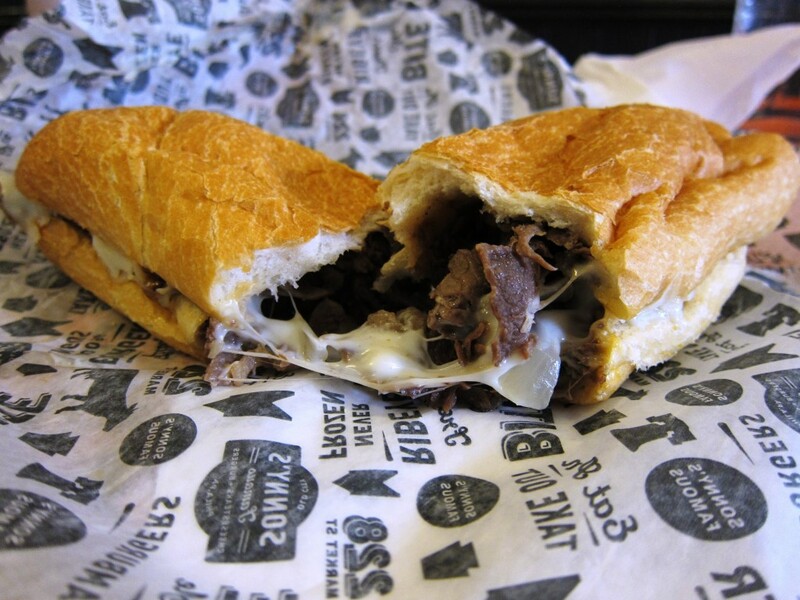 Sonny’s had good reviews, and their cheesesteaks did not disappoint. 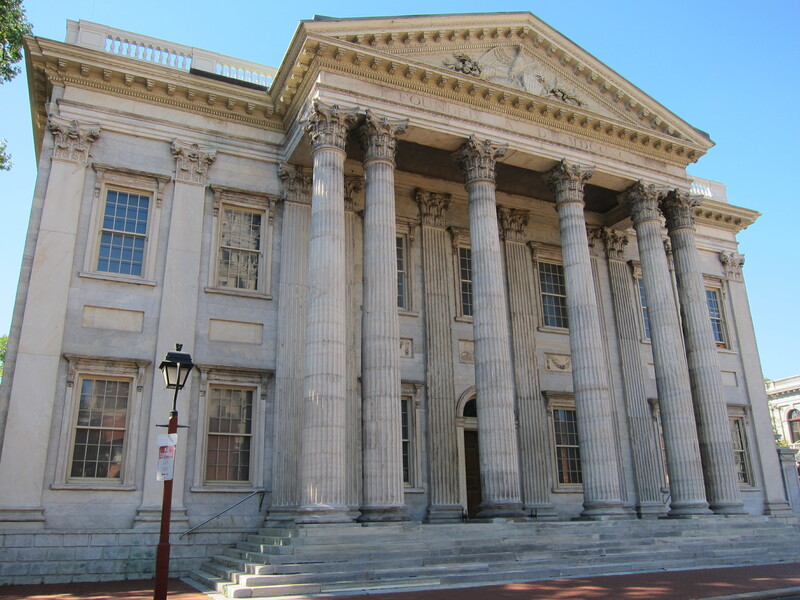 After devouring our cheesesteaks, we walked by the First and the Second Bank of the US. We couldn’t go into the First Bank, so I just took a picture of it, but the Second Bank had a portrait gallery inside. We saw lots of portraits of important people from the 1700’s painted by Charles Willson Peale. Inside the Second Bank, we talked to a NPS Park Ranger, who showed us an awesome app that has a lot of information about all the attractions in the area. The park ranger told us that even though the Independence Hall tickets are timed, we can still get into the square and visit the American Philosophical Society and Congress Hall – the two buildings to the right and left of Independence Hall. So we did that, and since we were already inside the security checkpoint area, we were first in line for our 4 pm tour of Independence Hall. 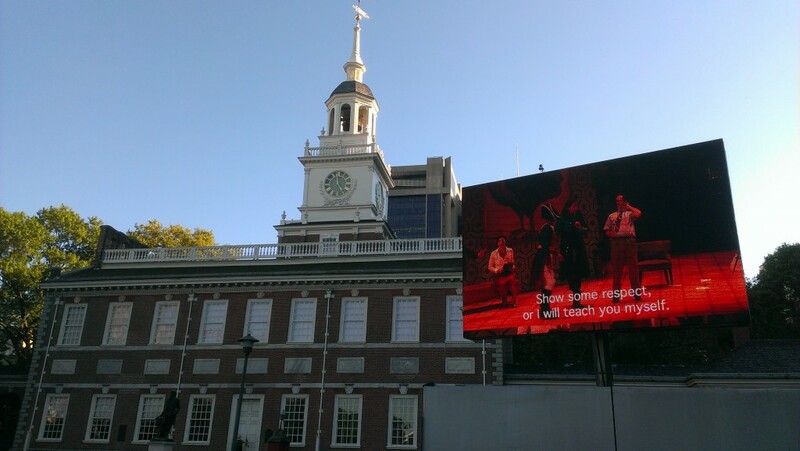 We walked out to the Independence Mall and saw that they were setting up to show an outdoor screening of an Opera. The opera wasn’t starting for another 2 hours, so we decided to make the most of the daylight hours and walk over to the Love Sculpture Park, and then come back for the opera. The walk to the park was kind of sketchy. We walked by some people proclaiming that all white people should be slaves, and saw lots of other sketchy characters. I can’t say I was comfortable during that walk. We got to the park right as most tourists were leaving and the park was filling up with local people, those who wait for the dark to hang out in parks. We snapped some pictures real quick and got out of there. On our way back to the mall we passed by the City Hall building, which was probably one of the most amazing buildings I’ve ever seen. By the time we got to the opera, we were STARVING (again), so we headed straight for the food trucks that were right across the street. We ordered a bunch of delicious and not so healthy food – fried cheese curds, a meatball sandwich, parmesan truffle fries, and a burger. That was between the 3 of us, don’t worry. The parmesan truffle fries were delicious and inspired me to make these Parmesan Truffle Potato Wedges (yum!). We sat down on the grass to rest our tired legs and watch the screening of the opera. They were showing The Barber of Seville. I’m glad that they were showing a comedic opera, because this was Aldo and Keri’s first opera experience, and I am not sure they would have stayed as long as we did if it was one of those slow tragedy operas. We had an awesome first day in Philly and after the opera we headed to our hotel. We stayed at the Fairfield Inn by the airport, because it was just so much cheaper than anything in the city itself, and had great reviews for the price. Since we had a car with us, it really wasn’t a problem to drive to that hotel. That night, we planned our second day in Philly – we were going to explore the Museum of Art and the surrounding area. Oh, and we were also going to get the best donuts and coffee in Philly. Or at least that’s what people told us. Stay tuned to read about Day 2! Have you ever been to Philly? What did you do there?